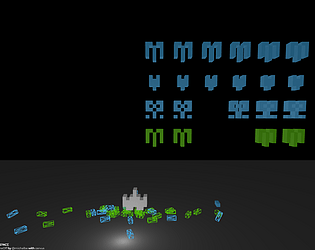 3d Space Invaders with procedurally generated enemies. Yeah, becomes unplayable on the first wave when there are about three enemies lift. I'm on a 4Ghz Octacore with 32GB RAM and a Strix 970. A cute idea, but not well implemented. This has some real performance issues, but otherwise very cool idea. Enemy destruction effect look awesome. There's actually a sort of beautiful irony to the game slowing down as you clear enemies, since it's the exact opposite of the original game which sped up as enemies got removed from the screen because it didn't have to draw as much stuff. I vote for procedural Galaga next! Performance issues aside, I really like this. Love the effect when an enemy is destroyed. Procedural generation keeps it visually interesting. If you keep working on this, it'd be interesting to have enemy behavior depend on the generated pieces (timing and flight path for example) to keep the gameplay from being repetitive as well. Almost crashed my computer as the debris piled up, you seriously need to fix this if you want anyone to give you a good score. I suspect each dead alien piece is an object, so the more you blow up, the more objects it has to model, which eventually kills the computer. Besides this, you have the kernel of an alright game. On the browser version it gets unplayable when there are too many enemy pieces in the ground. Maybe you can have a decay period so that they disappear. Hey, thanks for the comment. This is probably caused by some memory leaks in the physics engine (I use GoblinJS here), because I actually am removing parts of destroyed ships from the physic calculations after 3 seconds (they're still being rendered, but this isn't a problem here).